Handwritten letter to Jane (Young) Metcalf Betts from her aunt, Harriet Farley, in Burr Oak (St. Joseph County, Mich.), April 23, 1865. On the bottom of page one and top of page two, Harriet writes about the shocking news of Abraham Lincoln's death. She describes him as a "A father to his country, a tried friend of humanity". On Sunday, the local community marched from the Methodist church to the depot and had a public gathering with all three ministers present who spoke solemnly. She notes all town flags were draped in black. On Wednesday Elder Lamb gave a discourse at the Baptist house and Mrs. Wiltsie spoke at the schoolhouse. It is unclear if these last two speakers spoke of Lincoln or religious matters. 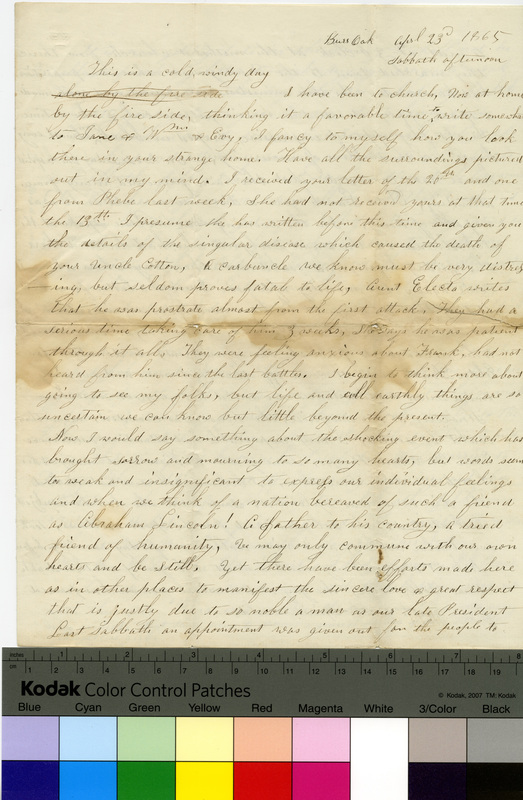 This is a long (4 page) dense, chatty letter about marriages, deaths, family and local news unrelated to Lincoln. Jane (Young) Metcalf Betts and her husband 1) Taber Metcalf, later 2) William Betts, and her son, Irving Metcalf, lived in Burr Oak and Saint Joseph County, Michigan, as did her Aunt Harriet Farley. Irving served in Company D, 11th Michigan Infantry during the Civil War. uncertain we can know but little beyond the present. that is justly due to so noble a man as our late President. a speech appropriate to the occasion, It was truly a solemn time. Elder Douste was to come off that afternoon and evening. could be seated, a very respectable and attentive audience. Church members were there. I believe all were astonished. over twelve dollars, and nine dollars on Friday evening before. Now it occurs to my mind I must tell you of another death. from earth to the spirit world. able to finish my letter tonight. My eyes are quite weak. is pretty good again, my ear has come to its hearing again. and all the folks. I shall not seem any time to be lonesome. Minta & the Col. Made quite a spread. They invited Mr. & Mrs. I don’t think of much more to write just now. would be so. We were glad to hear that Evy’s eyes are well. deaths and mariages[a-inserted, sic]. Yet the world moves on in its course. suits her pretty well at last. She appears quite like a woman. Has plenty of work, employs 3 women besides herself C and C.
anything the last I heard from her. It is now about 10 0’clock. ful of his health, and not work himself all up, be more patient.